I recently had a good chat with Simon Rippon who with Trevor Hopkins wrote an article on assets for this blog. We agreed that it is positive that there is a growing debate about how we develop a more citizen led approach to co-producing wellbeing. In part this is because the issue has moved into the mainstream, its no longer – why should we do this but how? Another reason is because of the undoubted success that some players have had in promoting their ideas – in particular those of Asset Based Community Development. Nonetheless, this debate will have passed most people by, largely because its between a very small group of people who promote and develop citizen led change in health and care. Consultants and some voluntary organisations – who are funded to promote and develop citizen led approaches to wellbeing. Citizens who are active within their communities – ironically, I think that this is the smallest group at the moment. They all share a strong personal commitment to citizen led approaches to wellbeing, but it is also true that the overwhelming majority of those above earn some or all of their income from the local or national state – in other words many are Asset Based Change Professionals. Scottish Community Development Centre – Community Development in Contradictory Times – looking beyond Asset Based Community Development. Kevin Harris in the Guardian in 2011-Isn’t all Community Development Asset Based? As I said this debate is happening largely within a tiny group of people so; it is tempting to say that the debate does not matter at all. By definition most citizen led activity is happening already within communities – and most of those activists are oblivious to this debate. Indeed as Trevor and Simon say in their earlier article ‘go down the pub and no one would know what you mean by participatory budgets’ in my view the same applies to terms like Asset Based Community Development! In centralised states like the UK (England in particular) a tiny group of leaders in Public Health England and NHS England determine future policy and funding. The rise in interest in citizen led approaches has generated a desire by some of these and their equivalents in Scotland to drive this work forward. Many of these people would not claim to have more than a limited knowledge of grass roots citizen led change, they are insufficiently aware of the rich histories, struggles and scale of what already exists. They work in an environment that likes clear models and requires simple messages that can be given to politicians. Its contradictory – but a tiny number of leaders at a national level can have a profound influence on approaches to citizen led change at a local level. There is little funding available to promote development and system change, so access to resources is hotly contested. While there are positive examples of thoughtful and inclusive attempts to commission work there are also cases where national health agencies have instead chosen to develop funded collaborations without any recourse to transparent commissioning. I think that this often happens when the evidence base is not very clear and people are searching for innovation, enthusiasm and simplicity. … and the grass roots? There are many organisations who have long track records of successfully supporting citizen led change, but they have their heads down; getting on with working on the ground. Some of these feel frustrated and threatened by the way that policy makers appear to be too easily seduced into backing and promoting specific models rather than recognising the diversity and strength of existing good practice at a local level. I am not convinced that leaders in Public Health England and elsewhere are sufficiently clear about the actions they need to take to respond to Jane’s analysis. Thank you for sharing this and all those brilliant articles. I particularly enjoyed reading the paper by MacLeod and Emejulu – they had me at “we reject the notion that objectivity in social research is desirable, or even achievable, but rather consider the importance of reflexivity and self-disclosure”! I agree with you that it is a small group of professionals having this debate, and your breakdown of the roles they likely have is helpful and rings true. I imagine if the Community Development Exchange and Our Society online community were still alive and kicking we/they would have been inviting, contributing to and reporting on these debates too – among people with exactly those roles. – The clear articulation of an inherent characteristic / risk that asset based approaches sideline issues around structural inequalities and don’t speak at all to the role of the market/private sector was really helpful. – I continually struggle with approaches that are all exclusively about relationships between the state/public services and community/citizens, I’ve never warmed to Alinsky’s approach as it feels focused on creating conflict between two groupings of people, and it was interesting to reflect that ‘ABCD’ is so much about that relationship too (I guess that will have been blindingly obvious to many people, I just haven’t stepped back to think about it in that way). – While reading the section on the American approach I was surprised to find myself feeling a little defensive of the work folk in the UK have been ‘evangelising’ even though I haven’t joined their congregation! I was pleased that later in the paper it was highlighted that Jane Foot and Trevor Hopkins do talk about structural inequalities in “A Glass Half-full”. – The quotes the researchers share from interviews with practitioners and policy managers resonate deeply. I’ll no doubt have more thoughts as I muse on this and get around to reading the publication by Jane South that you’ve quoted from. In the meantime, thank you for getting my brain cells firing, I’ve had a brilliant start to the day reading and thinking about all this! I look forward to seeing responses from other readers of this blog. Thanks again Mark for another stimulating and challenging blog and also to Lorna for your well-crafted reply – let’s keep thinking and discussing and welcome Lorna to the “small group of professionals having this debate” – although we suggest there is a larger group following it! Your observations on Alinsky’s approach exactly mirror a discussion Jane Foot and Trevor had when researching ‘A glass half-full’. The blog has led to us both reflecting on some of Mark’s comments and our knowledge of ABCD and asset-based activity in a number of locations. 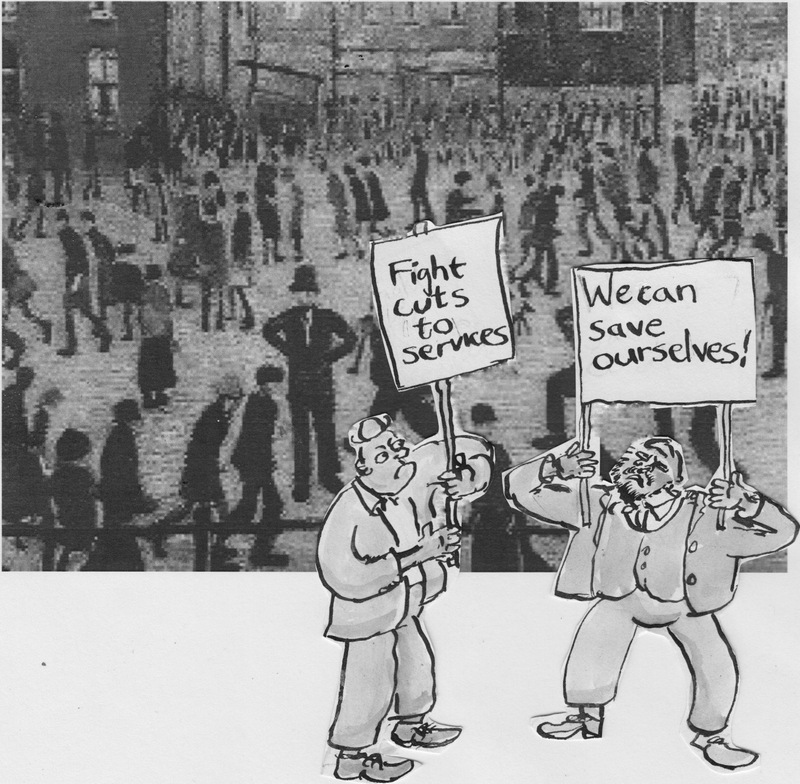 As Mark states in his blog, a particular idea of ABCD is being widely promoted as a single mechanism for addressing wider public health and health inequalities challenges in the UK. We write, in a currently unpublished piece, that: “Asset Based Community Development (ABCD) originates in the USA. We believe that some of the context, language and use of ABCD need refinement in the UK (and, for that matter, other places) as the context and history are very different. While we acknowledge some shared ambitions, ABCD was not developed in the context of health improvement and has no explicit links to the theory of ‘what creates health’ (salutogenesis) or the research and intelligence on ‘assets for positive health and wellbeing’. While we agree that one of the potential outcomes of ABCD may be improved health and wellbeing (and possibly a narrowing of health inequalities – but the jury is definitely out on this for many reasons) we would suggest that ABCD is only one of many asset-based approaches.” We prefer to use terms such as ‘community development that is asset-based’ or ‘asset-based approaches’ as these clearly indicate a different approach to the prevailing ABCD model with its intellectual base in the USA. We are clear in our practice that we are seeking to improve health and wellbeing through a range of approaches, including currently successful Public Health and health promotion activities where appropriate. We aim to contribute to the challenge of a widening gap in health inequalities by building relationships and supporting approaches in communities, associations and agencies (public state or other) that are place-based, citizen-led and that promote social justice and equality. So our question: has ‘Asset Based Community Development’ become hook and loop tape or is it Velcro? He is aware of the debate in the UK. He has read the paper published in Scotland and notes a range of misquotes, and inaccurate conclusions. Be good to see more balance in the debate, and more academic rigour -less ideology mascarading as research -hopefully some facts will enable people to make up their own mind. Hi Cormac – I couldn’t find any comments from John McKnight noting ‘a range of misquotes and inaccurate conclusions’ in the ‘paper published in Scotland’. Where were these noted? I read the blog quite carefully (did you write it?) – and again, wasn’t clear how this blog represents ‘John McKnight’s perspective’? His perspective on what – ABCD generally, or the debates about it? And which particular debates? Always happy to hear your views, but I’d prefer to go direct to source for the views of others! Especially when they refer to specific weaknesses in a paper which the authors, and others, might want to respond to. The more general point about ‘ideology masquerading as research’ seems rather rhetorical. Can research ever be separated from ideology? If there are methodological weaknesses, then perhaps we can examine those – if you have something particular in mind. Excellent post and wonderful comments to! Thank you so much. Firstly as soon as we aim to work on a policy objective, ‘health and wellbeing’ for example, are we not co-opting assets to the work of the policy maker instead of the community’s own agenda? Of course, if folk are asking for help with health and wellbeing as their major ‘presenting issue’ then ‘fill yer boots’. However usually at heart we are often using an asset based approach to tackle some policy maker’s prioritisation of deficits. On the structural inequality piece I see a lot in this. Asset based community development is, at its best, a process of development, not an intervention; a process which, if managed well, will be inclusive. And, IF interests are righty understood the process will have an inherent bias towards serving those with the greatest need. More often than not these are the individuals and groups who typically have faced the severest structural inequality. I realise there are a lot of IFs in that sentence. And I carefully edited out a ‘but’ or two. And I have played fast and loose with concepts like ‘community’ and ‘development’. At heart however I am with Schumacher. The first principle of aid should be respect. Using ‘ABCD’ to work on the policy makers’ chosen deficits without a clear invitation from the community seems to say the least ‘at odds’ with this principle. First, my thanks to Lorna, Simon, Trevor, Cormac, Mike and Lynn for their contributions. I think there are some key issues here. First, I think there is a bit of a theme running through some of the comments above. I don’t think that Asset Based Community Development is a ‘thing’ its a methodology – a set of tools, and at its heart it is not a lot different to other community development approaches. The challenge is in how these tools are then used, by their practitioners and what values these people hold. For many of us working in this world this analysis has to include a a recognition of inequality and exclusion. My personal feeling is Ideology = Values – and in the world of the easily ignored, marginalised and oppressed values are crucial. Second, Community Development has always had its critics some of whom have been concerned that it intentionally or otherwise weakens support by the state or takes responsibility from the state. Because of this Community Development practitioners in this country (also because they are usually funded by the state) have had to describe their relationship to state services. I think practitioners of ABCD need to do this too – they have to recognise the position and role they occupy. Once we work in the system we have a responsibility to define our relationship to it and the people we claim to serve.